Increase your cutting depth and linear efficiency with this 1-3/4" Wide X 2" Long Japan Tooth saw blade. It is applicable for wide scale aggressive cutting of most wood grades. 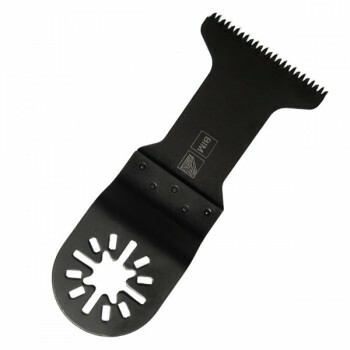 This Economy Saver Japanese Tooth blade is made from M42 Alloy Steel and has a precision ground double-row of beveled teeth which allow for aggressive plunge cutting into wood, sheetrock and soft plastics. Use this Japanese style blade to achieve high speed cuts. This aggressive blade will have you approaching reciprocating saw cutting speeds. These precision teeth also cut through laminates without chipping and the tooth design (kerf) resists saw dust loading saving your motor from work overloads. Great for plunge cutting into softwoods at maximum drive speeds and if you have a steady hand your cuts will have nice clean finish. The M5045 Japan Tooth saw blade is applicable for very fast and very clean cutting of softer woods such as pines, spruces and fir.